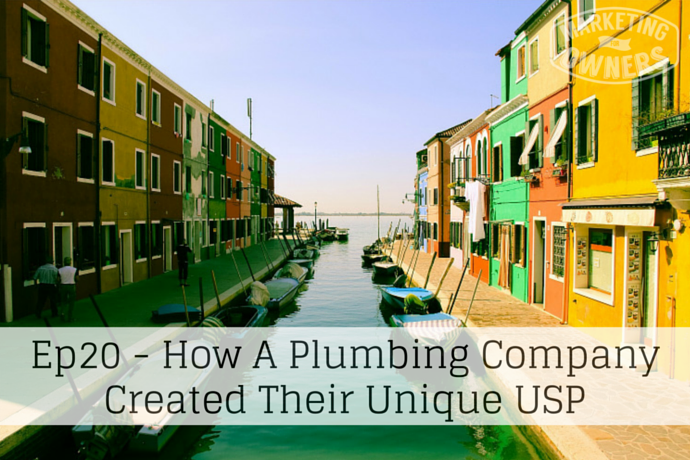 How a plumbing company created their unique USP. Welcome to Marketing For Owners, The Podcast. My name’s Jon, but you should know that by now. So, what about those plumbers? I was at a meeting, I think I mentioned it recently, although it was a few years ago in San Francisco, and we went through some exercises, and got talking about how to come up with a USP (Unique Selling Proposition). But these things are just features, they’re of no benefit for the customer, they’re just telling how you do it. That’s not a USP. And to be honest, it’s the same with my company. One my companies has free shipping, lots of companies have free shipping. It’s not a USP. You’ve got to find something that’s unique. If you want to stand out from the crowd, you need to find something that’s truly, truly unique and worth boasting about. Think of it that way. Now back to those plumbers. Remember we’ve discussed this recently? Remember? Involve your staff. Don’t just do this yourself because you got to think outside the box. Other people have great ideas; involve them. Even friends, family, others, suppliers, etc. But they sat down around the table and they discussed the problems and issues that come up — things that are unique, and they had a flipchart and they wrote them down as they came up. Now one of the things the guys mentioned was that generally their calls were in the middle of the day and more often than not the person who answers the door and deals with them is the lady of the house, the wife, the mum, maybe looking after the kids. So they looked at it from her point of view. They started to discuss it, “Okay, so what does she wants?” They pointed out that all the plumbers were men, and generally when they went to the house they are a man coming to the house with a lady on her own so she’s worried about her security. Now sometimes, they’d say, “Okay, lead me to your boiler. Lead me to your radiator or your pipes,” and of course the lady would then have to walk through her house with the door shut behind with a stranger, a big burly plumber, following her; that’s worrying. This all came out in the talk. So they pointed out that in the mind of the customer, their customer, they thought security and safety was a massive issue. Again, making the lady feel safe. Again, safety, security. They decided if she was following that would make her feel much more comfortable. And they worked through it like that. Now they worked through the problems and they came out with their USP, they wanted to be safe, safety. They did that, they implemented these changes, and their USP became the security and the safety. And they found that the referrals from their customers tripled. It was remarkable. And their business went up 50%, something like that. It was a huge jump and mostly from referrals because of their difference, because they were different. They didn’t just do it better, they didn’t have nicer uniforms. They created a USP– a proper unique selling proposition. So, come the weekend, this is going to be my challenge for you. I want you to take out that bit of paper, and the reason, by the way, for taking out a bit of paper is it sinks in when you write it down instead of entering it electronically, it’s sinks into the brain more. There are lots of studies that have proven writing stuff down helps it sink into the brain, goes deeper. I want you to start brainstorming USP’s. I want you to brainstorm everything you do, every aspect of what you do, where you meet with a customer, just the parts that meet with the customer. Turn it from the customer’s point of view, every aspect you cab find, write it from the customer’s point of view, turn it into a benefit, into a “what’s in in for them” because when I’m a customer that’s all I’m interested in. List those out and then see if you can come up with a new Unique Selling Proposition that is going to interest customers, going to stand you out from the crowd. Then, put it into practice. Today’s show is sponsored by Rainmaker, part of Copyblogger Media. And also, have yourself a nice weekend.